The Renault manufacturer announced about its preparedness to renew car parts export to Iran. Both representatives of the carmaker and the government realize that this decision requires pouring of money. Last month in Geneva, Iran and six countries concluded an agreement according to the automobile industry. The Renault auto manufacturer is trying to restore its influence in the Iran market. Its main rival Peugeot/Citroen holds the similar decision. 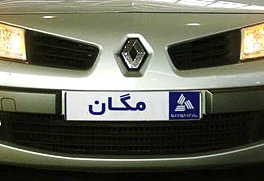 In 2011, the PSA maker held about 30 percent of the market in Iran while Renault had only 6 percent. Iran's auto manufacturers produce cars oriented to Middle East and the launching volume was 1.6 million vehicles in 2011. However, according to analytics, that country has potential to increase production cars to 2 million car per year. Because of the nuclear program, Iran is under some global trade, energy and financial sanctions. Moreover, last month the decision to reduce trade sanctions including car parts was made. However, export of the U.S. manufacturers are still under an embargo. The Renault representatives believe that this six-months period of reducing auto parts trade sanctions is the first step in future development of relationship in the world. Iran is one of the potential countries, which has an opportunity to grow its auto market.